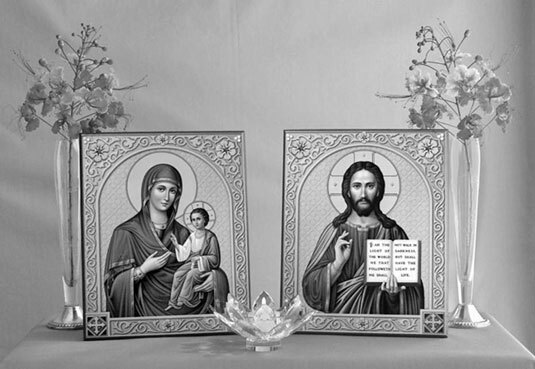 According to Orthodox Christianity, icons depicting Jesus, Mary, biblical events, and the saints are passageways for the worshipper to enter the holy presence of God’s Kingdom. This example of a simple Christian-based altar includes icons of Mary and Jesus with flowers and a candle, set on a table covered by cloth. Jesus represents Divine Love and the higher realms of Spirit. Mary represents Divine Mercy, which is compassionate, loving, and comforting. Together, Jesus and Mary represent the balance of Divine Fatherhood and Divine Motherhood in God. The candle expresses the light of Spirit, and the flowers bring the fragrance, color, and beauty of this world as an offering to the same divine Spirit from whence they came. Buddha represents the principle of enlightenment — the Buddha-Nature within each person that is revealed in meditation. 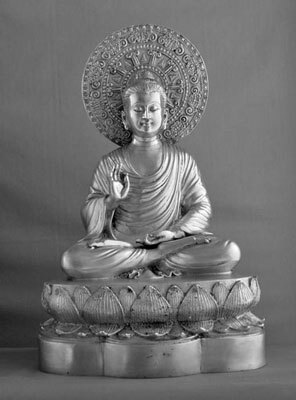 The circle of light around his head depicts Buddha’s state of enlightenment, and his left hand is facing out in a gesture of protection and fearlessness. Kwan Yin represents the active kindness of Divinity. She is the goddess of compassion and savior of those in distress, a loving presence who hears the cries of the world. Kwan Yin brings blessings and abundance and invokes the qualities of calmness, compassion, strength, and beauty. 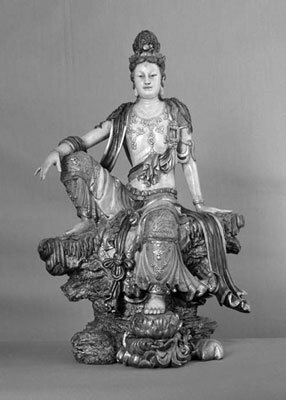 The style of this statue shows Kwan Yin in her royal ease position, expressing her stately confidence and grace. The Hindu goddess Saraswati represents Divine Creativity, including inner inspiration and the power of expression. Saraswati bestows the divine power that expresses through inspired words, music, wisdom, and the arts. 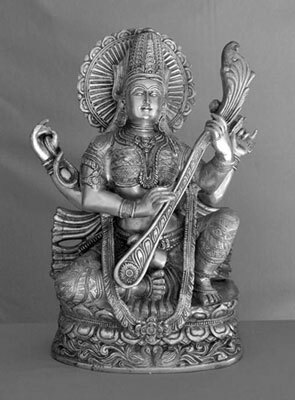 In this depiction, Saraswati is seated on a lotus flower, playing a stringed instrument called a veena. Ganesh represents profound wisdom and deep calmness and brings blessings of prosperity, wisdom, science, and skill. 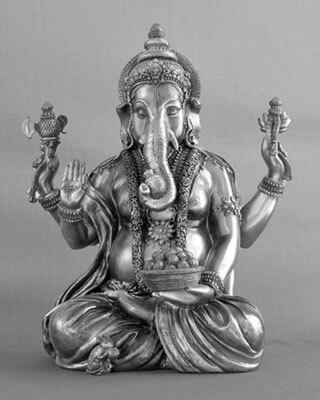 Ganesh is said to remove obstacles and ensure that your efforts are successful. He is often invoked at the commencement of a project or to begin a Hindu ceremony. Here, Ganesh is seated in a yoga posture, holding many symbolic representations of spiritual blessing and attainment.